REVIEW OF HOLISTIC DENTAL STORE ORGANIC MILD/ CHILDREN’S TOOTH POWDER (for children and pregnant women). Made with organic ingredients certified by Oregon Tilth, except the wildcrafted Myrrh. I know many, many of you are searching for the perfect toothpaste for yourselves, but especially for your children. Many of us avoid fluoride, but the mainstream fluoride-free toothpastes that are readily available, such as Tom’s of Maine, Jason, etc. have other chemicals we don’t want, such as SLS (Sodium Lauryl Sulfate), some have carrageenan, and numerous other ingredients. I’m on a mission to make as many of my own personal care products as possible, but just haven’t gotten around to toothpaste yet. I was thrilled when this product was offered up for me to review. Tooth powder– I had never heard of it. Info from their website: Mainstream thinking does not acknowledge that products put in your child’s mouth gets absorbed by their body and bloodstream. That is why we are pleased to announced a mild tooth powder specifically designed for children and pregnant women. Our ingredients are organic and wildcrafted herbs, and nothing else. No glycerin, no fluoride, no sodium laurel sulfate and no fillers or unlabeled ingredients. With our tooth powder there are no ingredients that take a chemist lab book to figure out what it is. Our mild / child tooth powder has a gentle and refreshing mint flavor. My children personally helped me formulate the tooth powder and we guarantee your child will love it, or you can return the product for a full refund. 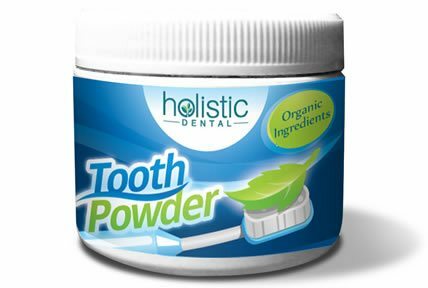 Mild / Child tooth powder from Holistic Dental is a tooth cleaner you can trust to put in your child’s mouth. Tooth Powder vs. Tooth Paste Tooth powders contain herbs which apply nutrients and natural medicines to your teeth and gums. Tooth powder is very slightly abrasive and much less abrasive than most tooth pastes or baking soda. Tooth paste is usually toxic with cheap fillers and ingredients. Many ingredients might be unlisted or mislabeled as cosmetic products do not require the same standards of food. 100% Natural Full Strength Ingredients: Wildcrafted White Oak bark, Organic Spearmint leaf, Organic Licorice root, Organic Slippery Elm bark. I liked what I saw as far as the ingredients go, so time to try it! My babe was 21 months when we tried it for the 1st time. I honestly had not been using any toothpaste at all on him, as I just hadn’t found one that satisfied me, so he just brushed with water. The test… Directions are to wet brush, then dip into powder. The powder has a spearminty smell, with an after smell of herbs. He LOVES it. The only problem is he wants to keep dipping, and dipping. I let him have 2 dips. What do I think of the taste? I like it, it tastes like spearmint. There is another full-flavor/strength blend, with more herbs, but I was told it’s too strong for many pregnant women, and even non-pregnant women. We’ve been using this product for a month now, and I really, really like it. I will venture into making my own toothpaste someday, but for now, I am enjoying this tooth powder, and recommend it without hesitation! My holistic doctor had be rubbing my gums with myrrh oil to help with gum bleeding during my 1st pregnancy. The reading I did on licorice root suggests it should be avoided in large doses during pregnancy, such as in teas, etc. I agree with the info provided that the amount is so minuscule in this product that it doesn’t pose a concern, and my doctor also agreed. That being said, I urge you do to your own research, and discuss the use of this product with your own doctor if you are pregnant, and come to your own conclusion! Very good point & legitimate concern! I also strive to use as little plastic as possible!